As a local business, you need "Google insurance". You want to control what someone sees when entering your business name in a search engine. The only way to control your web presence is through your own website. And for a local business, a one-page website is a great solution! The reason behind this is that you don't need all the bells and whistles an online business needs. You need a simple and clean solution to show off what you're doing, how customers can get in touch and provide some social proof. That's exactly what our new 'one-page-site' template is made for! You can find it now in the Thrive Architect templates library. What's a One Page Website Template? A one page website is a homepage, landing page and website all in one. Instead of creating a full blown site with different pages, you'll use this template as your homepage on your site. All important information about your business can be found on that same long-scrolling page. At the same time, if you put a prominent call-to-action on this page, it also serves you well as a landing page. Easy to update: You only have to think about updating one single page. Cheap: No need to buy a WordPress theme, this Thrive Architect template is all you need. Quick to install: As you can see in the video, loading this template only takes a few minutes. That's all the time you need to get your website up and running. 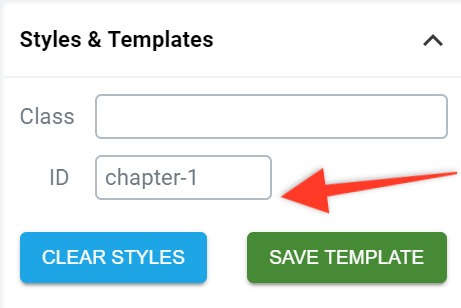 Create a new WordPress page, give it a name and save it as a draft. Now, edit the page with Thrive Architect. 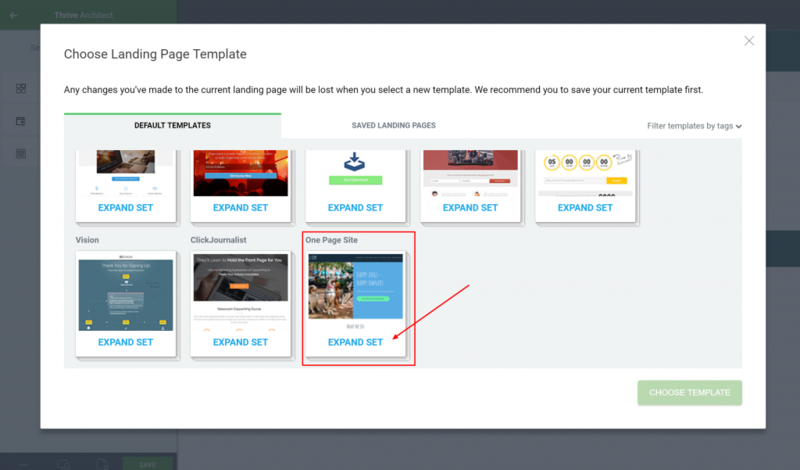 Go to page setup and select the option "Choose a Landing Page Template". From here go to the "One Page Site"-set and select the dog walking template. 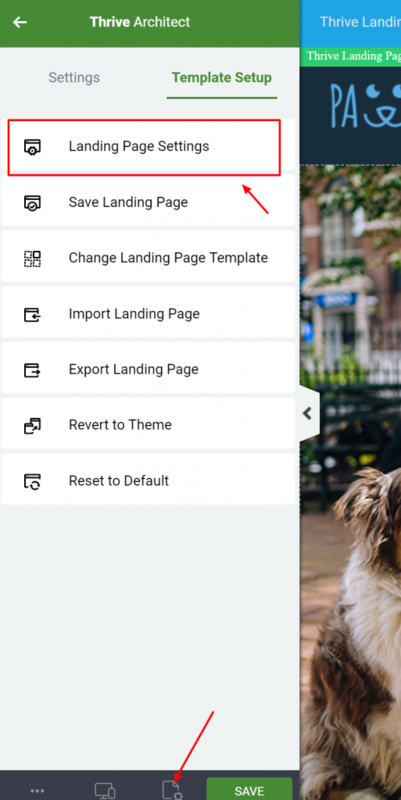 Now that you have the template loaded on your site, you can start customizing it. You can replace the images, change the text, change colors etc. The menu on this page is not actually a real menu item. It's a list of links that are linked to specific sections on the page. When a visitor clicks on one of the links, the page will automatically scroll to the right section. These links are called Anchor Links. 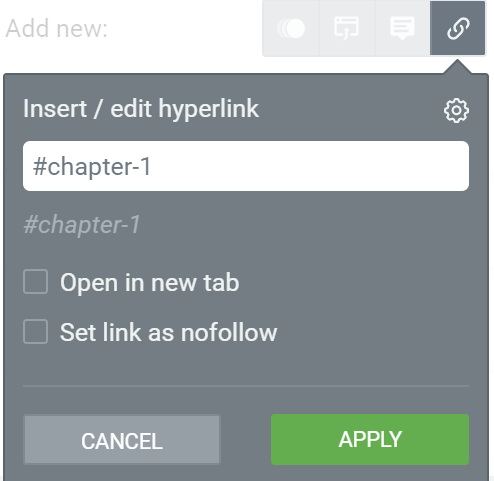 To create an anchor on a page, select any element on the page that you want the user to be scrolled to (usually a background section) and give this section an ID. You can do this in the Styles and Templates menu. You don't need to confirm this entry by clicking on a save button. Whatever you enter in this field will be applied as the element's ID. The link format is the hash symbol (#) followed by the ID name, with no spaces in between and no http:// or www. before. If you're looking to change the color of the links and the hover color, you can do this on landing page level. Go to "Page Setup" and then "Landing Page Settings"
From here you can change all the font settings of the complete landing page. Hyperlinks are part of these settings. This will change all the links on the page, including the menu links. Thrive Themes would not be Thrive Themes if we did not include an option for you to collect leads! This template uses a 2-step opt-in form. There are 2 buttons on the page that are linked with a lightbox. In order to edit the lightbox, click on the button and go to the animations and actions menu. This will open up the Open Lightbox Action. From here you can click on edit the lightbox which will open a new tab and allow you to edit the lightbox. You only have to do this for one of the two buttons on the page. The other button is linked to the same lightbox, so all the changes you make on the lightbox will automatically apply. In order to be able to send the coupon, you'll need to connect your site with an email service such as Active Campaign or MailChimp. If you need help to connect the lightbox with your email service, we have detailed tutorials for you for just about any service. Once you're finished with the customisations, you can save the page in Thrive Architect and hit the publish button (in WordPress). 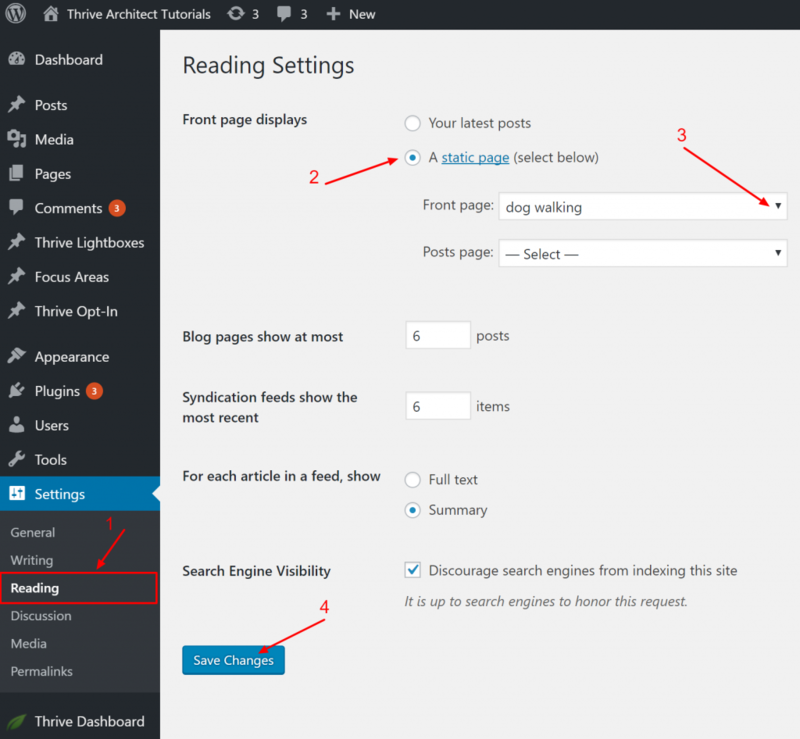 In your WordPress dashboard, go to "Settings" >> "Reading". From here select "Static Front page" and in the front page dropdown menu you'll find the page you just published. Select this page and hit the "save changes" button. That's it, you've just created your one-page website! I hope you like this new template and the "one page site"-concept; quick installation and easy updates are ensured, perfect for a local landing page. If so, I would like to hear from you... What should be the next business we create a one-page site template for? Let us know in the comments below! A local artisan company, for example a painter’s firm. I’d love to see a charity landing page. Something that collected donations instead of emails. That would be fantastic and a bit different. Thanks for the suggestion :) How do charities usually collect donations? Do they use a specific service? There are many ways they collect donations, but one of the easiest is the non-profit version of PayPal. Yep paypal would be the most common. Stripe probably second. My site is pretty much like a coaching style that can be used as a reference. Good to see the introduction of different styles of web properties. Loads more to be sure, but a big step for these types of local independent services that are usually found via word of mouth. Thanks for the suggestions Tony! Is there any way in which once I create a site with this template, then I can export it to html to upload it to a cPanel and use it without wordpress? This is great. It would be awesome to be able to add a blog in the same style as well, so you can start to communicate with your customers and/or prospects. But with the new theme it will be possible to have the blog in the same style. Very good video. I’d love to see a template for art work. Looking at setting up a local business style page and have the lightbox show a contact us page linked to our email provider instead of an autoresponder. For example… dentist inquiry with a drop-down menu to display options like teeth whitening fillings, or root canal, etc. continue to collect full name and being local, phone number or address option to send literature/information if they would like to receive this by post or our phone number displayed with opening times and google map within the pop out section. The phone number being mobile responsive, call us section on pop out to contact business immediately with a push of a finger would truly make this a local business page . Thanks for the suggestions Anthony. That didn’t seem to do anything. Didn’t hurt anything either, but is there something else that needs to be done I’m missing? I pasted everything at the bottom where instructed, but nothing seems to have changed, when the menu links are clicked, they still jump immediately to the sections. Thanks! i also tried to imply this, didn’t seem to work for me either. also added the commands.. didnt work. Well the one things that’s missing from the code is the script tags. Thanks, Paul. I had the script tags in my comment but they were stripped out. 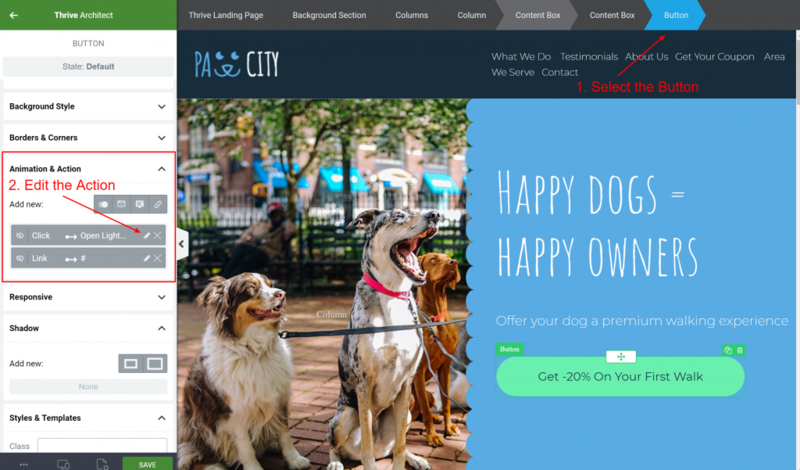 Ha, as the owner of a dog walking company, I smiled when I saw what the theme design was for this landing page hehe. SEO is really important for local businesses so I do have a question. If we apply the usual techniques to get Google to fall in love with our site (have a blog, have a Google business page, etc.) Will using a landing page like this one be as beneficial as using a regular WordPress theme? What are your thoughts? Using a template like this will have no disadvantage over using a single page made with a WordPress theme, in terms of SEO. Depending on your theme, loading times might be slower than when you use a simple, single landing page like this. So that could be a small advantage. But for the most part, if content and markup are the same on both pages, it won’t make a difference whether it’s a “theme page” or a landing page. Well, is a nice idea but I didn’t like much the template this time – guess is the first time it happens with Thrive Themes! Anyway is always good to see that everything is simpler then we imagine. Maybe doing some other 2-3 “generic” versions – one more serious, other more artistic and a home focused services, also more plain – would cover 80% of our needs. I agree, a generic simple version where we can change the images, background, content, etc easily to be a one size fits all for most local business will be great start. Similar to the “Bright” Series concept. About a more generic template, we found that most people will still request specific templates for their industry. It can be hard to find the right pictures and color scheme etc. That’s why we prefer creating specific templates. Nice tutorial Hanne! I am already working on a one page template, for a man and van removal services. Any secrets i should follow for a single page template? No real “secrets” :) I would make sure to have social proof (testimonials) and anything you need to reassure the potential client about the quality of the service. I agree. This is a great list of service industry site templates that would be very helpful. Thanks! I second this list! For me personally, I build quite a few plumber, electrician, & construction 1-page websites. It would be great to have a few templates specifically for them! I’d add Coach and also Consultant themed templates to that list as well. Could not have said it better Chris…and it could also work as a good starter site for someone building a business and just starting out. Yes this is not for everybody. Congratulations, very well explained. A question: does a page make organic search difficult? Is it possible to make seo in it? But of course here their would be no interlinking (links within your site). If you’re trying to rank this site for “Best dog walker in America” you’ll most likely never succeed. While you could do this, SEO would be difficult as presumably each business would have a different address, etc. Maybe you could use subdomains for this purpose, e.g. widget-to-buy.considerthis.com as these are different websites under the same domain. Thoughts anyone? Technically yes you could do that, but my question would be: Why? My suggestion for a one one page site is for musicians/band. Or artists. This is my clients and there is no good site tamplate conversion focus for artist out there. This will be awesome! Thanks. You Guys are awesome, How about a one page, for a coffee shop? Thanks for the suggestion. Have you seen the current template we have in the ThriveBiz set? Fantastic as always. Maybe you should consider a template that is totally generic with elements that can be easily edited and used in a lot of different types of businesses. I have no problem editing this template for pretty well any kind of business but others may not be that confident. So maybe just a video showing how this template can be modified for other businesses. So, this must be installed on a brand new WordPress site, correct ? It cannot be installed on a pre-existing WordPress site, whereby it would override the existing site content and automatically show the new one page site, correct ? I am thinking of the possibility of being able to offer a potential client, who has a bad website, the opportunity to get this new one page site which could, after install, show as the landing place from initial click-thru. But whereby I could assure them, to eliminate perceived risk, that the new site could be undone/deleted, and thier old site would now, once again, be there as before, with no lost content. This is just a landing page like any other landing page. In your scenario, you could set up a new page – just like Hanne did – and then tell WordPress to use that new page as the homepage – just like Hanne did. If your client wanted to switch back, all you’d have to do is switch the WordPress homepage setting back to the original home page (or whatever it was before you switched it) and they would be back to where they started. You can use this on a brand new site, but you can also use it on an old site with many pages on it. Hanne, amazing post like always! Thanks, Hanne – This is a great solution for Local Businesses… I have ideas spinning in my head! From the video, it appeared that when you clicked the link to jump to testimonials, it did so instantly. Is it possible to have a smooth scroll option (or would this require another plugin perhaps)? For the moment it jumps, yes. We do have a task somewhere in line for smooth scrolling, but I have no ETA on this. I’ll add my name to the list for smooth scrolling and hope it is implemented sooner than later since it greatly enhances the browsing experience. Adding an optional “return to top” floating button would be another amazing feature. Very Interesting,but I will like to see how to create a mortgage website template or if one page will be enough? It depends on the purpose of the site. If the site is simply a brochure for your service it can work. Awesome as ever, Hanne – thanks! I’d love to see a template for marketing/business consultants. A one-page website is nice if you simply want to have an ‘online brochure’. A place where you can send potential clients/customers to learn more about your business/services. But, I don’t think you should suggest using a template like this as the only page of someone’s website. 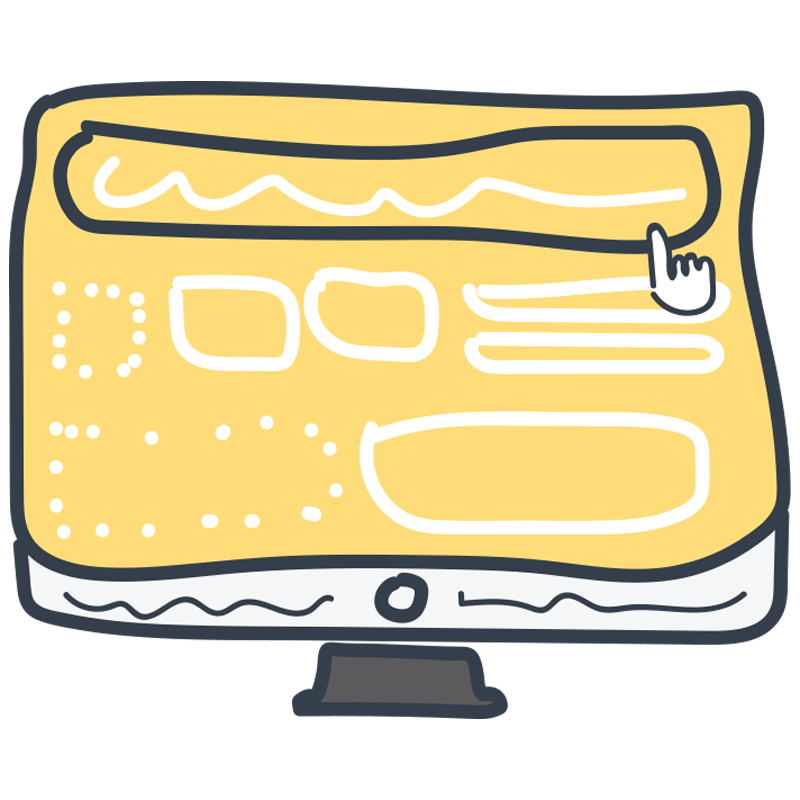 If a person is serious about growing their business online… a one-page website won’t convert. It’s going to hinder your SEO abilities (you can’t focus on keywords), conversion rates, etc. You’re right and was thinking the same thing however you could still have a blog attached where posts are SEO optimized and leads could be captured. Good point. This one page template is for sure not for everyone. It is exactly for what you’re suggestion an “online brochure”. Thing is that many (most) local businesses don’t need to try to rank for keywords because their core business is not online. They simply need a place to communicate their opening hours etc. Can we make it so it does a smooth scroll to the section instead of a quick jump? This seems to be a common feature for other landing page builders. Agreed. I’d like to have a smooth scroll to the sections. Surely there must be a way to do it. I did not see a return to top button or arrow in the video. There is non, but you could add an icon (or a text link) and use an anchor link to do so. Here’s how to create an anchor link. I am an author and wish I could have a website template to sell my books. I am looking for funnels that will make my books stand out. I am also looking for funnels that comes with a paypal button. You can easily integrate PayPal with any button! When you created your PayPal button, go to the “email link” instead of the embed code. That’s the link you’ll want to link to your button. I had a one-page site for my computer repair business a while back. It worked fine for us. I didn’t have a form to add your name and email address though. Thanks a lot for the video. I would a template for therapist. I think a one page website for a “one product” company would be great. It can be thought for lots of domains, but the idea is to sell a unique product. Something hybrid between a sales page and a “one page” traditional website like the one you have shown on this tutorial. The next template could be a website for a craftsman! Thanks for the suggestion. I agree that some templates would be pretty similar. Hi. I really loved this template. But I’d like to see some related to wellness or yoga in a one page format too. Thank you! Finally, something simple to make by just changing content and not having to think about design. Hope you have slightly larger DONE sites coming with 4-6 pages including a blog?? You guys and gals are awesome. Hanne and Thrive Themes: I think you can see how many people want a homepage template with the possibility of menu buttons. Your landing pages are great but there are many other gigs that require the ability to be able to use a landing pages that do not cover up the menus on the home page. I believe someone or more people have told your company this. Good luck. And great video by the way! This looks great! I’d love to see one for Health Coaches! I gotta be honest. I wasn’t a fan of Thrive at the beginning (a few tech glitches and support issues). But in just a couple of short weeks, I have become a HUGE fan. What you all are putting together for people and how simple you are making it for non-techies is really something extraordinary. I love, as well, Hanne and her “how to” videos; she does a great job of explaining! If there were to be a one-page that I would love to see it would be a one-page for “writer for hire” that would list out pricing for different things (blogs, press releases, powerpoint presentations, article, e-book, autobiography, etc.) PLUS add a place for people to pay via paypal and have a place where people could submit some project they need so that you could give them a proposal. That would be ideal. Thanks. I think what you’re asking for is slightly more complicated than a one page website, but we do have several people asking for service related templates so I’m adding it to the list. Hi Hanne – I was thinking that Thrive Quiz Builder is the tool to use for creating any type of marketing brief, the type of info form Paolina is asking for. I haven’t figured this out for myself yet, but that’s my plan. For me it would live on it’s own specific page – for the service biz template you might want to insert the mini-brief in a lightbox and use a button to trigger that (I think). Hi Hanne and team – here’s the key differentiator to focus on – reducing the complexity of creating a useful, hard-working site. You have done an excellent job here. I think the focus for anyone reading this post is building a site can be fast and simple – and it can still get the job done communicating offers and generating leads. Rather than creating an array of small business site templates (that’s what themeforest and all those competitors do anyway) – I’d like to see a set of focused tutorials explaining the steps for creating pages in Architect that ensure the page is device-friendly (mobile) and hard-working (lead generation). I would love to see videos have the same or similar format, which they sometimes do already. An example could be a demo of how to build page elements from starting with a box and filling the box with design elements (columns or pix element or text-whatever) and how this specific building sequence ensures your page will work on multiple devices. What I think describes my request is a set of blueprints for creating elements. I think every user would benefit from understanding the steps to build a page, from the foundation, to the placement of walls and rooms (design elements), and the wiring & plumbing (lead gen elements). The final decorating of the room would be the design scheme and branding, finishing with content (is the content furniture, or is content more like a person who is helpful?). This type of resource (knowledge asset) would increase in value as members become more fluent in the mechanics of WHY/HOW the elements perform. That’s because it reduces support requests. I have the feeling there are a ton of people who just want a darn design and want to move on… I understand that. You are serving them well. Then there are others like me who want to understand how to best use the tool. We are having to hunt for those instructions in design videos. If you can separate the content of the video tutorials into mechanics v design – that would be helpful. As it is, the treasure bits, the HOW to make a page sequence is often buried in the concept of design. It’s kinda like CSS vs html – design v structure. Except it isn’t a competition. I want to know how to create the structure before I add the design layer to the final product. Thanks for hanging in to the last thought. Thanks for taking the time to write down your thoughts, I really appreciate it! As for your request, I think you’re right. There are the people who love a “done for you” template and have something up and running quickly and there are the DIYers who want to learn all the ins and outs of the product. Shane is working on a full Thrive Architect course that will go through all the features and how to use them best. And I’ll have a brainstorm on how to best offer what you’re asking for. I think for now, the “Landing page from scratch”-series is probably closest to what you’re looking for. I agree with much of what David M said and really looking forward to learning more from Shane’s forthcoming full Thrive Architect course. Do you guys ever sleep? Hi Hanne, Thanks for all the work! I love what you all are doing – this will be a good start for a tree trimming service site on my horizon. For more complex sites where we want to have posts, pages, landing pages etc I think the new theme you all are working on will help fill in the knowledge void – eg setting up the site style from the beginning – like you do when setting a new landing page, but for all the aspects of the site, header, footer etc – eg do you have a landing page as the home page for each main category in the site and then have posts that talk about each sub-category – so there are a few thoughts to consider. Have a great weekend! Thanks Craig, will keep that in mind! Looking forwards to the day when Thrive Themes build funnels to compete with ClickFunnels. Hanne… great 1 pager. Love it! So maybe “NEXT” would be a Local Service Business…. Maybe a Air Conditioning Repair Co. ( We r in Florida ) or maybe a Sports Trainer??? Or Lawyer, Dentist? Better Yet a Caterer. Ahhh you decide. All your stuff is Awesome!???? Thanks again for a fantastic template. It could be nice to see a template for a hairdressing salon. This is really cool. I liked learning about the anchor links on the page because I’ve always wanted to do that and could never figure it out before. Thanks for that! Just small FYI, I think you’re missing your More… tag on this post. For me, the entire post is showing on the blog feed page. Oups… Thanks for the heads up! I would love to see a one page template for personal trainers! One issue I’m having with editing this template is changing the highlight color in the anchor menu. Can you explain that a bit further? That’s a very good question, sorry about forgetting to explain that. The hover color of links is set on landing page level. This means that you have to go to “page setup” > “landing page settings” and then you see “hyperlinks” click on the “hover” button and you’ll be able to change the color. I’ve also added this to the original article with screenshots if you need more help. Nice template and we could do with some more for local businesses such as house cleaning and lawn mowing. I have a question. What is the purpose of the second action on the CTA button. i.e. the link to #? It’s the standard link that any button has (that links to nothing) so you can just remove it (hit the delete button). Yep landing pages are perfect for that. To offer such service to local businesses,what kind of licenses do we need? Use our license and the page is hosted by us, or what is the business model? Hi Stef, if you want to offer this for clients you have two options. Have the client buy a single license of Thrive Architect which will allow you to intall it on their site or buy an agency license for you which will give you the same option. As always you guys find ways to add value to what we do every day as marketers. I appreciate that. Thank you. We’ve heard the old KISS “Keep It Simple Stupid” for years but somehow we always find ways to complicate things. I love the simplicity of the one-page website. It gets the job done and looks professional. I’d much rather someone that lands on my website instantly know what I’m about. At that point, they can either optin and become an email subscriber or leave the page to find what they were really searching for. Once they’re in I can start a dialogue/conversation with them to see if we are a good fit. Here’s what I mean by a good fit. I’ve found that people theorize much too often without actual proof through implementation. I’m a data person. Show me the data where you’ve tried a one-page website as it pertains to a local business and it didn’t work. From that point, we can have a meaningful conversation. Until then it’s just conjecture. A friend of mine created a one-page brochure in the Real Estate niche that was about 10% as niche as the one Hanne created. He built a 7-figure business from that one-page website. 1. You opted in to get his free report on homes in the area he was farming. 2. You left the website. There wasn’t even a navigation bar at the top. Again, thank you Hanne and Shane. You guys are one of the best organizations in this space. I open all of your emails. I will definitely be making use of this template. Yes, this is an awesome idea..I can try this on my online restaurant page, Good feature. I suggest also checking out the Thrive Biz set in there you can find a template specifically for a restaurant. Next you should do a 1 page website for a massage therapist or a mortgage broker. business owner should be aware of its USP…wording etc is imo dependent on the niche and kind of customer. Anything else like Design Elements etc. you could do with TA in minutes. Love working with TA…would like to see a few other things like an accordion function, woocommerce integration as well as the predicted new theme to be able to do an overall branding smoothly. Thanks for the suggestion Volker. Copywriting and storytelling is important for sure. I have a potential client who has classes at multiple venues. I’m thinking of creating a Google My Business page associated with each venue address. However, this would be defeated by a single website that linked them all to the same business. However, a single page website for each venue would work. Nice idea, thinking of customer needs again and beautifully presented as always. Glad to see how you immediately try to use this for your clients! That is a great looking template. I’d really love to see a real-estate appraiser page as well as a funeral flowers page. Lots of requests for different templates for specific local marketing businesses, but it seems easy enough to create our own templates. People should just look up some nice looking websites in their niches and replicate them (not make an exact copy, of course, but you know what I mean). Make it yourself once and it’s ready to use as much as you like. Plus by building it yourself, you’ll know every element and everything about the structure so you can change it up easily. hi Hanne, thanks for the beautiful template! i see an issue i think on the page.. when you decrease the page width, the menu dissapears..
That’s the way our designer imagined the mobile view. If you prefer keeping the menu, you can click on the paragraph/text element and go to the “responsive menu” from there you can see that this element is hidden on mobile and phone. If you want it to be visible, just switch toggle. OMG Hanne, you guys read my mind. For someone who learns visually it certainly helps to see something in real time and working to get ideas from and this template speaks directly to me. This isn’t just for local business. I can utilise this template for almost everything I have in mind and straight out of the box with minimal customisation. With a little creativity it can also be utilised perfectly with the Quiz Builder Plugin to gain lots of new leads from those followers who are being gained via social media. The only thing I’d like to see you expand upon here is how to add additional menu items to the navigation menu (not through use of anchor text) through the traditional route so that, for example, I can include ‘Blog’ within the menu and my visitors are redirected to my supporting ‘Blog’ posts. I suppose that this defeats the objective of having a ‘one page’ site but nevertheless I’d like to see how this can be done with this particular template. Although I am a newbie to WordPress and learning something new every day, I am beginning to realise that Thrive Membership was the best investment I could have made. New stuff that is useable, useful and beneficial seems to get added to my membership weekly, if not daily. That continues to be priceless. Really great to hear that! The easiest way of adding a link to your blog would be to write the word “Blog” and to add a normal URL link there. The other way to go would be to use the custom menu item and replace the links with that item but in that case you will not be able to easily combine anchor links and normal links. Thanks Alek. It will be available really soon for our customers. No you would need an email marketing service such as Active Campaign or MailChimp (free) in order to set it up. Because the goal is to get an email list (a list of people you can contact later when you have a promotion or…) and that’s only possible with a “real” email marketing service. Great template Hanne love the improvements that you are guys doing. Based on this template I was thinking of “one product” page with and option to offer 3 bundles of the same product. A one page template like this combined with a previous template that you guys showed with 2 or 3 types of pricing. ( you did that with a coaching type of business). Could you do a “combination” template between the 2? You could also pretty easily adapt the Clickjournalist set to match a physical product instead of coaching. Smooth anchors, I know it is on your agenda. Looking forward to seeing that feature soon. This is great! I used it for a small massage business whose owner only wanted a simple site. He loves it and so do I. Thanks, Hanne! Nice work and great idea. Please do one for a marketing consultant, copywriter, funnel architect, web designer, writer, ping pong club and church. Thanks for your suggestions. I think for those templates we would need more than just one page though so that everything can stay consistent. I was creating a website from scratch to track ROI on direct mail campaigns. I think I can use this template for that purpose – it iwill save me time. The direct mail campaign sends a sequence of three direct mails – a postcard, a envelope that looks like express mail, and a final postcard. All of the direct mail pieces have call to action to schedule an appointment by calling “unique number tied to direct mail” or going to a unique website e.g SolveMyProblemXYZ.com (I made up this URL for posting the comment – this is not my website) This way I can accurately track the ROI of the direct mail campaign – it is not tied to the main website, where it would be difficult to track attribution, also it is easy for a user to type in their browser “SolSolveMyProblemXYZ.com”. Thanks for sharing John, I agree that the one page website would work well for this purpose! I’d love to see one that serves as a homebase for someone who has multiple sites and wants to use it as place to direct people to the other sites depending on what journey they want to take with them. So like dog site where you have those three boxes in the design those would be areas where visitors can find the person’s other sites for instance a book site, or a product site, or a services site. This would work well for someone who is a speaker (or maybe just create a speaker template) but may offer other products/services besides speaking. Thanks for such a great template and detailed post. I noticed that when I load a template ready to start editing, the headings and sub headings mess up when I mouse over (hover) any headings. The font changes and the heading stretches across the page with large gaps between words. It can’t be about fonts I don’t have installed on my laptop can it, otherwise all website visitors would experience this every time they rea any page, if they don’t have a certain font in the computer /ipad/phone etc? That’s a weird glitch… If after doing a hard refresh (CRTL + F5) you still get this, don’t hesitate to post on the support forum so that we can investigate why this happens on your site. When you say about doing a hard refresh, when do you mean it should be done? Do you mean straight after loading a template? Yes. But it might be a conflict with another plugin. That email that you use as an example would be created from within your hosting platform. You could use that address with an email service (such as MailChimp or ActiveCampaign) it’s not possible to connect directly to such an address without using at least some kind of email service. Yes you can. We suggest installing YOAST SEO (a free plugin) and you can set up Google Analytics. How ’bout this one for a demo? Hello Hanna, great job you’re doing. Please can you tell me how i can make the picture next to the text like in this homepage. I always keep some space between the textblock and the image. Please can yo help me. In this template, the image is added as the background image in a column (rather than as the image in the column) this will avoid the spacing. There are other ways to do this though including changing the “gutter width” in between columns an making sure there is no margin and padding. Can a funnel be integrated into this? I use clickfunnels for a mortgage landing page funnel. I would like to be able to stop paying $100 a month. I would love to see this for an independent hair stylist’s business. I coach hairstylists who rent their chair and they are self-employed and need to create their own website and a one-page site would be perfect. Love that you’re offering more and more templates! I am a functional medical doctor and I’d love to model my site after: https://www.parsleyhealth.com/ <– offering a site template similar to this would be amazing. Clean, easy to navigate, educational. Thanks for all your hard work! Nice one pager for sure. I love your tutorials and Thrive Architect, Hanne! I am a financial planner and life insurance specialist. Perhaps one for each? Thanks Burt. And thanks for the suggestions. Okay, this is outside of “the box”… How about entertainers? Magicians, Balloon Artists, Face Painters, Event Party Consultants, Balloon Decorators, Mobile DJs, Wedding Locations, Ministers, Churches. Mothers are ALWAYS looking online for good quality entertainment for their kiddo’s parties. Again, Thrive knocks it out of the park! Thanks! Can you do one for bookkeeping services? Authors, speakers and digital marketing consultants would be great. Thanks for the template it looks really good and simple to implement. I am thinking of using it for my company with 3 different branches in 3 countries. Is it possible to have 2 light boxes for different download’s or opt-ins and not have them linked in the one-page site? Also, can we add other thrive plugins to this theme for eg. thrive comments, thrive quiz builder, thrive leads, etc. Yes you can create new Thrive Lightboxes and yes you could totally add elements from out other plugins to this template! What Type of Dog Do You have (Breed)? When would you like to schedule the first walk? For that you would need a survey solution and list generation. If you only ask multiple choice questions you can accomplish this with Thrive QuizBuilder. Love this idea, would this one page work for me as a family photographer? Would like to see an “Entertainment, or “Magician, or “Mentalist” one page website. Is there a way to create a site that could host all these one page sites and have company’s domain name link to their one page site page on our site? Then create page for different companies ABCD.com/company1, ABCD.com/company2 etc. and then redirect the domain http://www.company1.com to ABCD.com/company1 but the final URL that people see will still be the lather. I would not really recommend this… I would simply set up different sites on the different domains! I honestly don’t understand why developers continue to make local business landing pages that fail to connect a client with a prospect by phone. If we’re talking local business then you need to appreciate most prospects pick up the phone and call, usually because they want to ask a quick question or get a quote before they commit. They want some instant answers. Most good ‘local’ business operators THRIVE on live phone call enquiries, not people joining a mailing list or making webform enquiries. 1. Web forms for local business only encourages the prospect to leave and visit the next competitor website and do the same. 2. A prospect on the phone can be closed immediately, preventing them from continuing to look for a solution elsewhere. Why would you encourage your prospect to do anything other than calling? If you’re going to focus on bricks and mortar local business, you really need to focus PRIMARILY on the phone number as the first point of contact – the form can be there as a backup if its late or the prospect just doesn’t want to talk to someone, but 90% of prospects calling a local business want a quote before they make a booking anyway, so a phone call puts a smart local business operator in the driving seat to close the deal every time. Would love to see some landing pages where you take this into account. Luckily, adding a call button or link is something you can easily do in seconds. Here’s how. I think maybe I didn’t get my point across. I would love you to focus a session on showing some powerful call to action local business sales pages that focus on driving phone calls if you can please. I would love to see a heating and air conditioning template. nice to see and good functionally, but the “Menu” runs only on Desktop. In generally, how can I use a “Menu” like this on Tablet or Mobile Devices? It gave me over Eastern lot of grey hairs more. 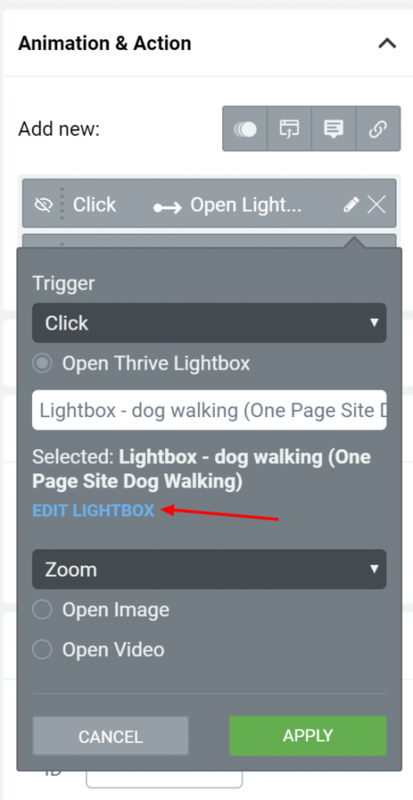 sorry, but I found the solution for One Page Site Dog Walking menu visibility on Tablet and Mobile Devices. Sorry for the grey hair, it was probably just set to “not show” on mobile in the visibility settings of the menu. 1. Is it possible for the menu bar at the top to ‘follow along’ with the selection chosen. The menu bar disappears after you click on a menu item and then you have to scroll back up to the top to click another item in the menu. If the menu bar followed the search, the visitor would only have to then click on another menu item, without having to scroll back to the top of the page? 2. Also, I am confused about Don I’s statement below about SEO which was (“but one of the issues with a one page landing type site is no SEO options or any way to optimize your site to get rankings, which even though is local, but still important, especially to those of us who live in a large metropolitan area”). Your answer was (“Yes this is not for everybody”). Does this mean that this ‘particular’ website template you gave the above tutorial on has NO SEO option OR IS IT ALL THE LANDING PAGE TEMPLATES? 2) This landing page templates has all the “normal” options to optimize for SEO (you can have title, description, meta tags, …) The discussion about SEO was whether a one page website would be good for SEO or not. The reason I said that this is not for everybody is because if you have a page with 50 pages, your chances of getting traffic from search engines is 50 times higher than if you have only one page. But again, it’s NOT the case that this landing page can not be optimized for SEO or is missing “SEO options” nor do any of our other landing page templates! If you’re interested in learning more about SEO, you might find our free Thrive University course about SEO for non-techies interesting. Thank you for your quick response Hanne! I am very new to Thrive. You answered 1) this is a simple menu and cannot be made to be sticky . . . IS THERE A WAY TO MAKE A MENU STICKY IN THRIVE? Can it be done in another landing page template or maybe created from scratch in a landing page BLANK template? This is quite important to me. It will appear as soon as you select “relative” or “absolute”. Please note that this is probably not the best way to outline a text element though. If possible, use the “alignment options” (that are not in the advanced section). This will allow to keep mobile responsiveness. This is a follow up to my question posted yesterday regarding the Advanced Editing element. I finally figured it out :) I re-watched the tutorial a few more times and realized I had not clicked on the ‘Relative’ area and also the position box. I am so new to Thrive Architect and the learning curve is a little harder than I thought it would be. But I am figuring it out. Just as a side note. 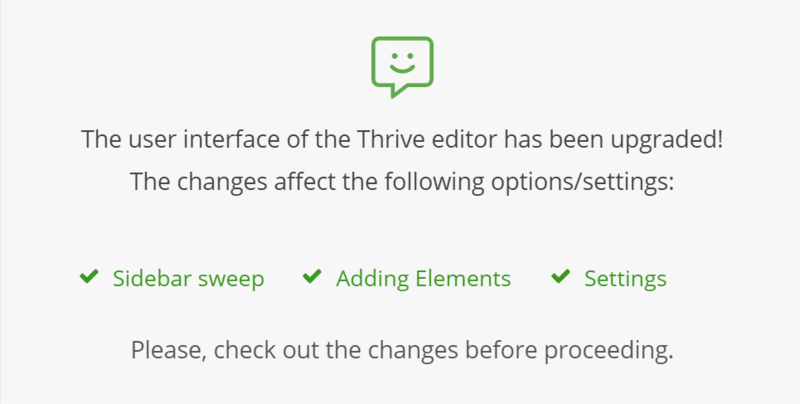 I have watched tutorials using the old editor (Thrive Content Builder) and the new editor (Thrive Architect) and I have to say that the New Editor is far superior to the old. Great job on improving what was already a great tool. Thanks for creating this template. I like it a lot. Wondering where to change the clip-path. Any ideas? Very good one-page website template and tutorial, thank you, Hanne. Any plans to build one for a digital marketing agency? Hi, Hanne, Shane, and the whole team. I became a member last month and have watched many of your tutorial videos. For whatever reason, I missed this one until today. It’s absolutely the PERFECT solution for me!!! Get up and running now, then build out my vision over time. The Thrive University is the primary reason I became a member, and have decided that all of you guys are brilliant in the simplicity of the concept behind Thrive. Putting it all together like y’all have was hugely complex and time-consuming. So, hat’s off to the whole team!!!! Thank you for your dedication to us “little guys” in the world of the Internet marketing/presence and entrepreneurship!! What type of software are you selling Abhishek? Hi, how about a page for a self-published romance novelist :)? I can give you some good examples, if you are interested.